After configuring the Raspberry Pi in monitor WIFI/802.11 mode (first blog post) and after configuring Raspberry Pi to send the 802.11 captured traffic to WSO2 BAM and Apache Thrift listener (second blog post), now I will explain how to create a simple Dashboard showing the WIFI traffic captured in real-time. Well, to make it easier, I created a Github repository (wso2bam-wifi-thrift-cassandra-poc) where I copied a number of scripts required for this third blog post. I encourage you to download and follow the instructions below. 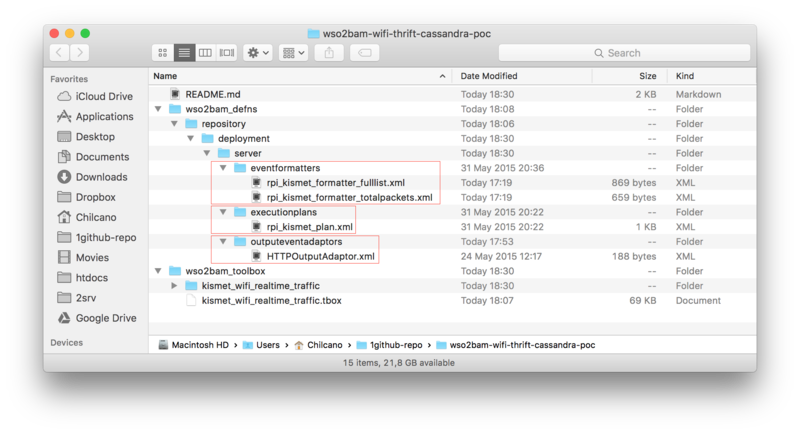 A toolbox to view incoming Kismet traffic (802.11) in realtime valid for WSO2 BAM 2.5.0. A set of definitions to create Execution Plan (CEP Shiddi), Input and Output Stream Definitions (Apache Thrift), and Formatters. I’ve used a Raspberry Pi as agent to send captured 802.11 traffic to WSO2 BAM by using Apache Thrift. 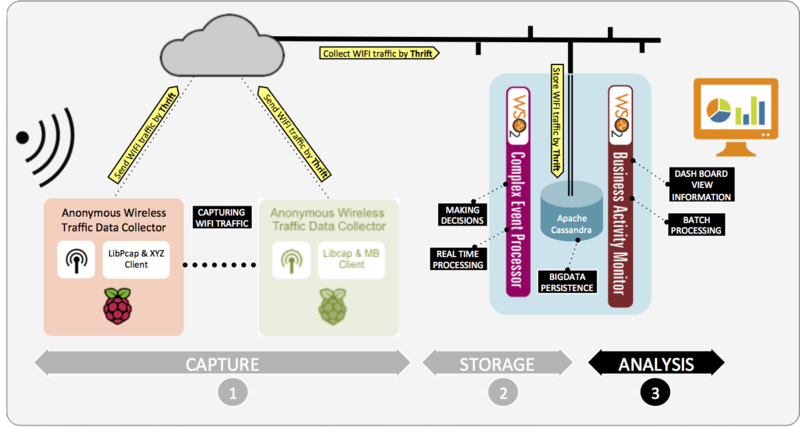 I’ve used a Python Thrift and Kismet script to send the captured traffic. Follow this first blog post to configure your Device to capture anonymous 802.11 traffic. Follow this second blog post to send 802.11 captured traffic to WSO2 BAM / Apache Thrift listener. 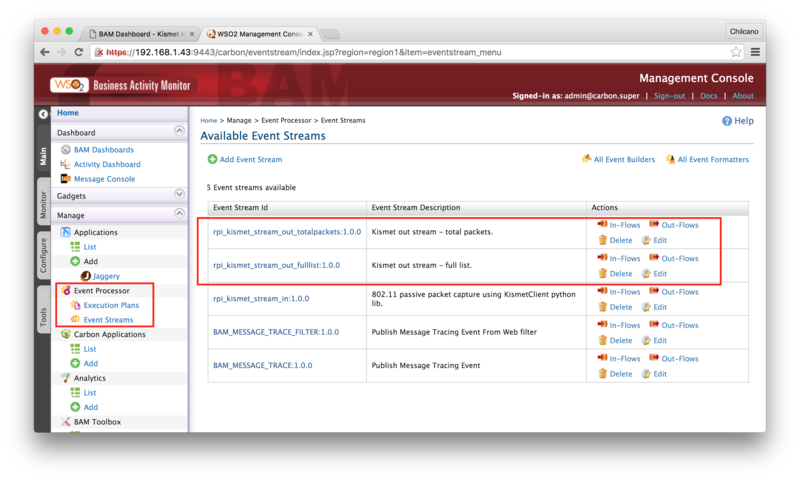 Check if the Kismet Input Stream was created in WSO2 BAM – Input Streams. If so, WSO2 BAM is receiving the incoming Kismet traffic by Thrift listener. Deploy the kismet_wifi_realtime_traffic.tbox in WSO2 BAM. Check if WSO2 BAM toolbox was deployed successfully. Copy the set of definitions to create Execution Plan (CEP Shiddi), Input and Output Stream Definitions (Apache Thrift), and Formatters to WSO2 BAM manually. All files and directories to be copied are under wso2bam-wifi-thrift-cassandra-poc/wso2bam_defns/ and have to be copied to /. If everything is OK, then you can see the incoming traffic in realtime, to do that, you have to use the previously installed/deployed WSO2 BAM toolbox. 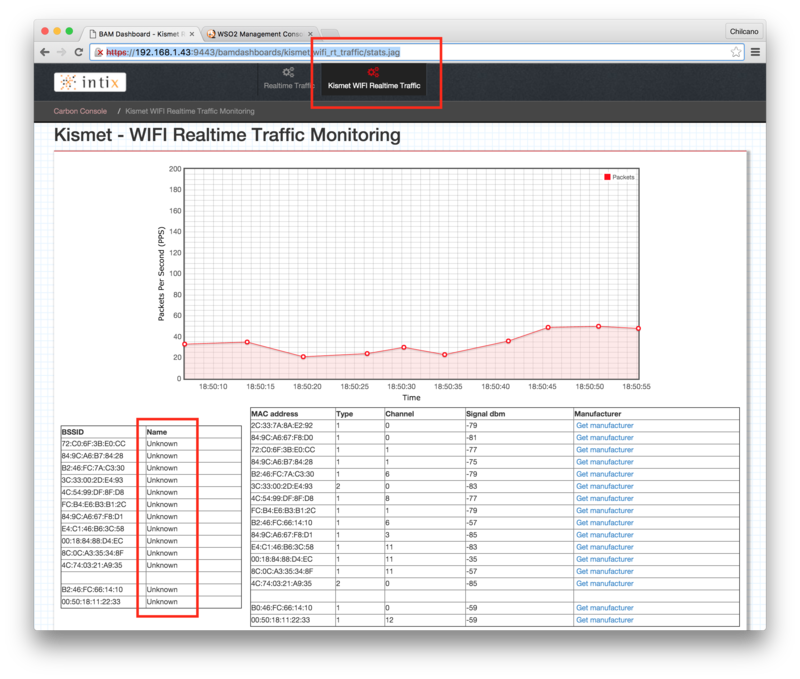 Then, login to WSO2 BAM Dashboard and select the Kismet WIFI Realtime Monitoring graphic. You should see the following. In the next blogpost I will explain how to implement a Microservice to get the Manufacturer for each MAC address captured.